By modifying the design and using high-strength steel, Chamberlain replaced the heavier, thicker structural bar and more expensive manufacturing process with a lighter roll formed alternative. The result? A material cost savings of more than $550,000 annually, a 34% reduction in weight, and an added annual freight savings of $120,000. To save time and money up front, be sure to select the correct material for your next project. Metals such as aluminum and steel posses a powerful ability to manipulate their physical condition during the manufacturing process without losing their physical properties or strength. This allows metal fabricators to heat, cool, melt, mold, bend, punch and stamp the material into the desired profile during sheet metal fabrication. But the devil is in the details, making material selection a critical part of cost control and design integrity. The list below outlines all materials available for fabricating. Aluminum extrusions are a commonly designed engineering solution. Aluminum, when treated, is resistant to corrosion, and aluminum extrusion dies can be relatively affordable. Aluminum billets are fed through the dies, molding the material to the desired shape. Because of the process’s continuous nature, aluminum extrusions are a good solution for lengthy parts. To lower costs even more, aluminum extruded products can be redesigned for roll forming using steel, reducing material needed to achieve the same strength tolerance. Steel, at significantly less cost per pound, is another commonly used material for metal parts. Like aluminum, steel is strong and durable, and can be treated to be highly corrosive-resistant, making it one of the top materials for roll forming. Through roll forming, steel is fabricated by passing a flat-rolled steel coil through a series of tooling dies, which gradually forms the desired profile. 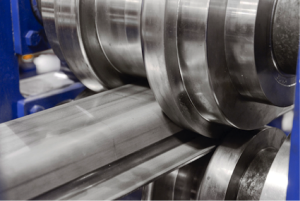 Roll forming excels when multiple processes are required, such as punching or tapping. It can perform cutting and forming operations simultaneously and in-line, reducing labor and speeding up production. Stamping and press braking are also viable alternatives for sheet metal fabrication, though they’re not best suited for complex geometric shapes, long parts or high volume production. As Chamberlain found, inline punching of holes during the roll forming process allowed engineers to change over to a thinner, high-strength steel while still dropping gauge, reducing material and freight costs. When selecting a material, reducing costs, simplifying production and cutting weight are essential. That’s why partnering with a metal fabrication company that combines innovative metal solutions, cost-effective results and engineering expertise makes perfect sense. With advanced equipment and experienced engineering, a broad range of materials can be utilized to create custom design shapes. Does your part require simple bends or complex linear shapes? Which materials and processes are capable of achieving the desired profile? With a fresh perspective, re-envisioning metal products can extend product lifespans. For agricultural manufacturers, specifically, utilizing leading edge materials and coatings can improve corrosion resistance, lengthening in-the-field lifespan. What other parts must the component interact with? In what conditions will the end product be used? What materials are best suited to hold up against long-term use or environmental exposure? Weigh the initial impact on cash flow management versus the long-term return on investment before finalizing your next project. What is the expected production run and EAUs (estimated annual units)? Is tooling cost amortization an option? Consider the size of the product you are designing. Roll forming allows manufacturers to fabricate parts up to 53 feet in length. How long is your product? Which processes can accommodate the required length? With roll forming, secondary processes such as notching, perforating, punching and post-painting can be incorporated into tooling and dies, reducing time and labor. Are additional processes, such as punching or tapping, needed? Can these be added in-line to automate processing and accelerate production? Save time and money using our standard profile engineering guide. Engineering drawings for these profiles can help cut down on design time for roll formed products. All profiles utilize roll tooling already in-house at Hynes, decreasing time to market and lowering total cost of production.